AAD recently became a centerpiece of modern financial systems, and a key skill for all quantitative analysts, developers, risk professionals or anyone involved with derivatives. It is increasingly taught in Masters programs in finance. Wiley's Computational Finance books, written by some of the very people who wrote Danske Bank's award-winning systems, offer a unique insight into the modern implementation of financial models. The volumes combine financial modelling, mathematics and programming to resolve real life financial problems and produce effective derivatives software. The book also covers the design of generic, parallel simulation libraries, and modern and parallel programming in C++. It comes with the complete source code of a professional, efficient, up to date AAD library in C++. The publication builds the code step by step, while the code demonstrates the practical use of the concepts and notions. ANTOINE SAVINE is a mathematician and derivatives practitioner with leading investment banks since 1995. Antoine was the Global Head of Fixed Income Derivatives Research for BNP-Paribas for 10 years, and presently works with Danske Bank, whose xVA system won the In-House System of the Year 2015 Risk Award. 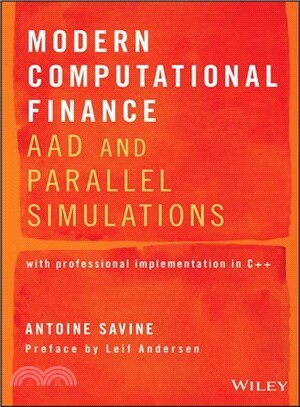 Antoine's Computational Finance books provide a unique practitioner insight into the implementation of derivatives models. Antoine lectures in the University of Copenhagen's Masters of Science in Mathematics-Economics, including Volatility Modeling and Numerical Finance, for which his book AAD and Parallel Simulations is the curriculum. Antoine holds a Masters from the University of Paris (Jussieu) and a PhD from the University of Copenhagen, both in Mathematics. He is best known for his work on volatility, multi-factor interest rate models, scripting, AAD and parallel Monte-Carlo.